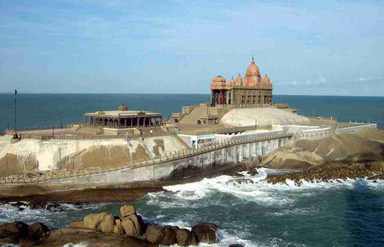 Kanyakumari is one of the most sought after destination of India. Noted for different reasons, it allures tourists from far-flung areas every year. Located at the southern most tip of India, the beach is beautiful beyond expectations and imaginations. 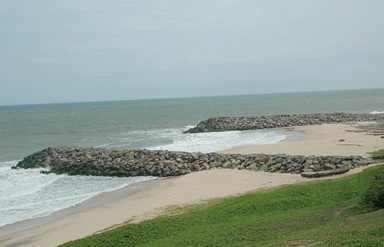 Associated with different Hindu legends, the beach enjoys a distinct location. It takes the pride of being one of its kind beaches on the earth. Amalgamation of three water bodies- Indian Ocean, Arabian Sea and Bay of Bengal is the geographical factor that made this beach popular across the globe. Kanyakumari is one of the beaches that offer breathtaking sunrise as well as sunset views. Being the meeting point of three water bodies, the beach holds a significant place in the Hindu religion. With the belief that a bathe in the holy water of this Sangam will wash off the sins of devotees, a large number of worshippers takes a dip at this ghat. It is a huge stone peeping out of the sea. This beautiful rock is said to be the meditating place of Swami Vivekananda. 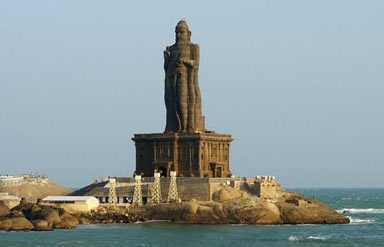 Now housing a life-size statue of Vivekananda, the rock also houses a memorial, which is dedicated to the great personality. The place holds great importance for the followers of Vivekananda. Dedicated to Kanya Devi, the temple is beautiful and holds a prestigious place for the followers of Hindu religion. According to the legend, Kanya Devi was an 'avatar' (incarnation) of Goddess Parvati. She was to wed Lord Shiva but he did not turn up and wedding never took place. The belief says that food remained uncooked that day, which is still available in the form of stones. Tourists can see the stones there that exactly look like rice and other cereals. Visitors are allowed to enter the temple through the northern gate. The eastern entrance is opened only on special occasions. 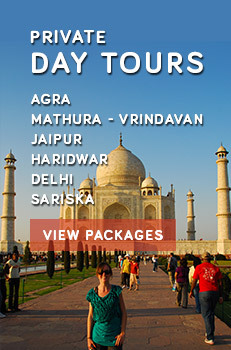 Accommodation options in Kanyakumari include luxurious stay as well as budgeted stay. By Air: Thiruvananthapuram airport is the nearest one and serves international as well as domestic tourists. By Rail:The destination is well connected with rest of the country through a wide rail network. By Road: Kanyakumari is connected by regular and frequent bus services with all the nearby cities, which include Chennai, Pondicherry, Tiruchendur, Tuticorin, Trivandrum and Madurai.